Here are two quick and easy recipes for sautéed greens. 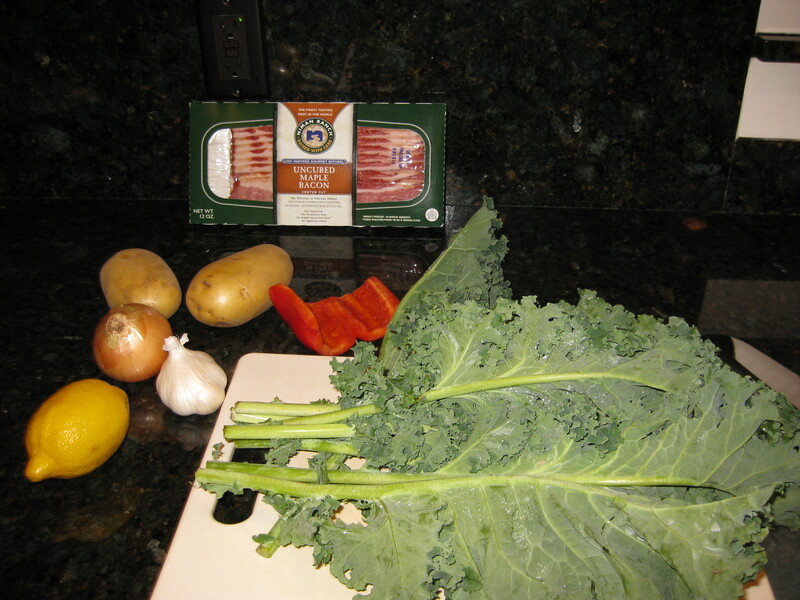 The first combines kale with potatoes and bacon and the other mustard greens, cannelloni beans and bacon. Great side dishes or a complete meal. 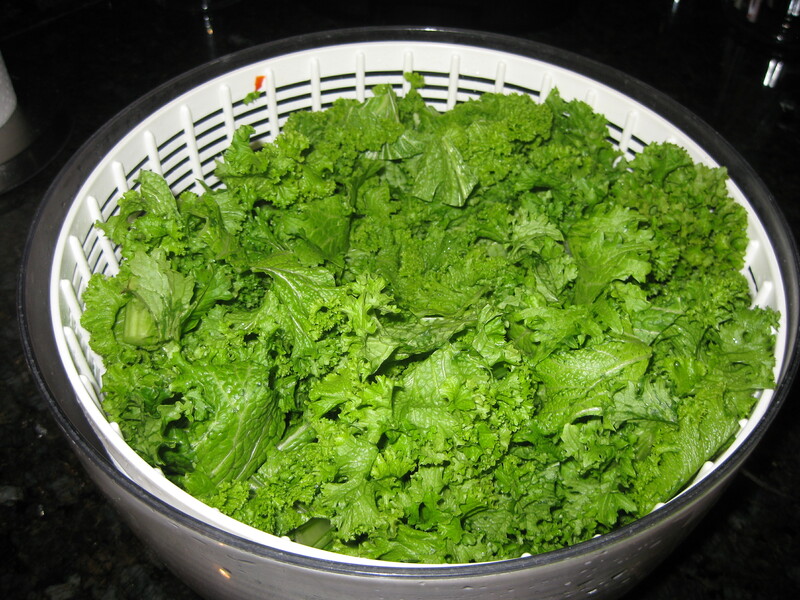 Read this post on how to clean and store winter greens. Onions, garlic and lemon contribute flavor. 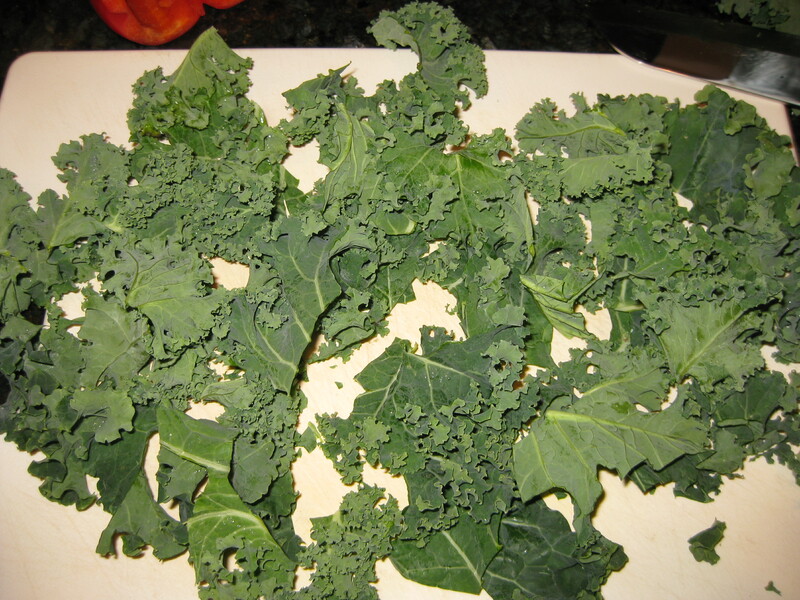 Wash and spin dry the kale, remove and discard the tough stems. Stack the leaves horizontally and cut into a rough chop. Dice the onion, mince the garlic and cube the potatoes. 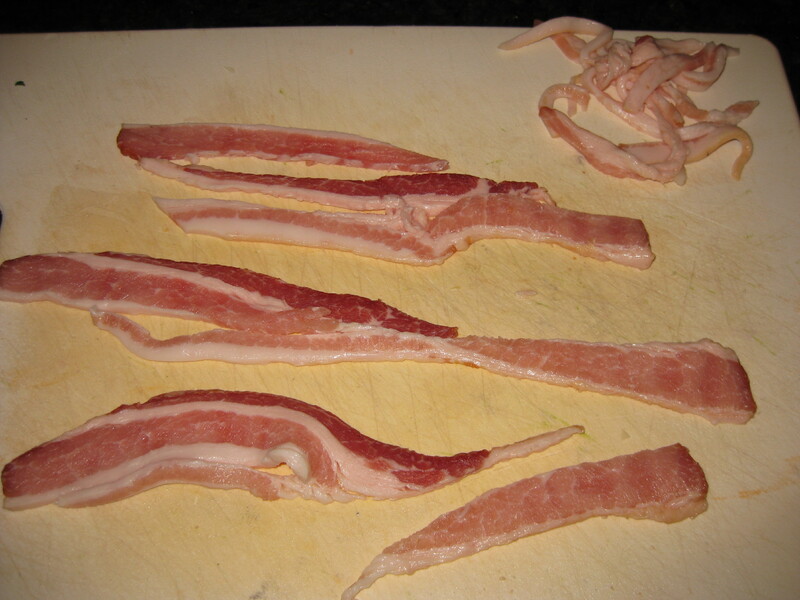 Trim any excess fat from the bacon and dice. Start the bacon in a cold pan, it prevents sticking. Add the onions, potatoes and garlic and cook until the potatoes are tender. Deglaze or dissolve the fond on the bottom of the pan by adding a little waterand scraping the browned tidbits up with a wooden spoon. This is what the pan looks like when you’ve finished deglazing the fond. 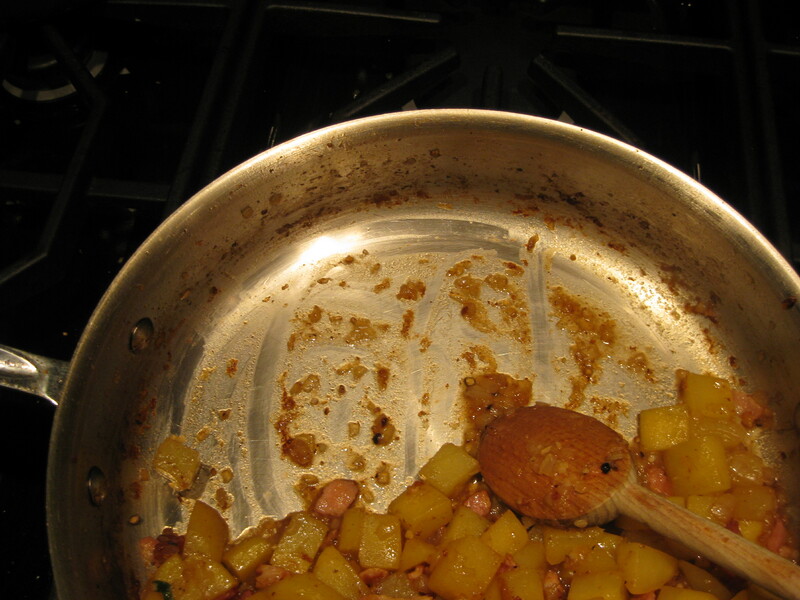 There is only a little water left on the bottom, the potatoes absorb some and the rest evaporates. You many need to deglaze the pan 3-4 times. 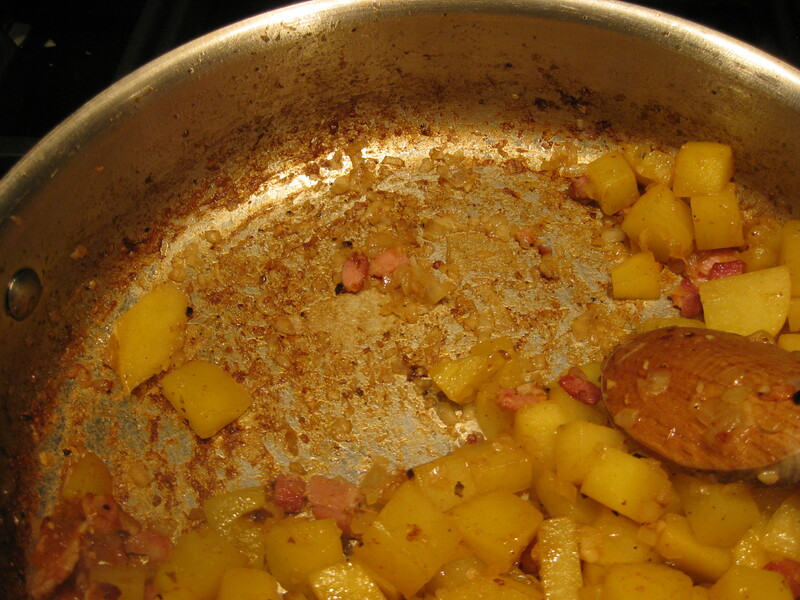 Don’t let the fond get too dark or you risk having a burned flavor in your finished dish. If you find the fond returning quickly and getting very dark, lower the heat. 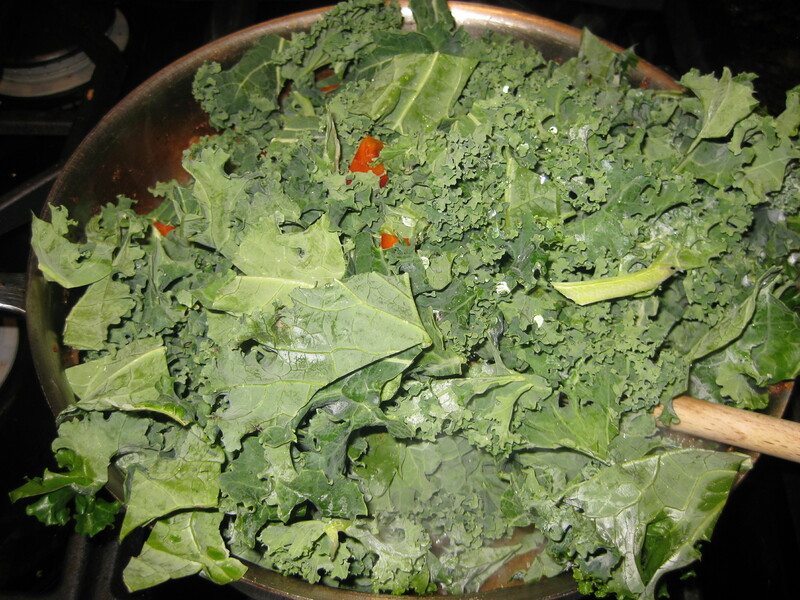 Add the kale and peppers, cover and steam until wilted. Season to taste. 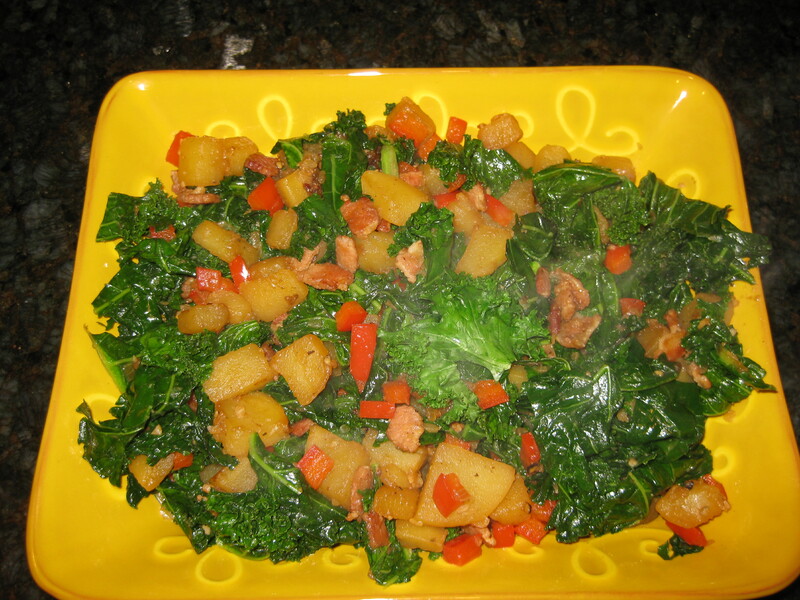 Hearty kale with potatoes and bacon, a delicious side dish or a meal. Place the diced bacon in a cold pan over medium heat and cook, stirring occasionally, until fat is rendered and bacon is crisp. Lower the heat to medium, add the potatoes, onion, garlic, salt and pepper. Add more salt later. The bacon contributes saltiness, too. Cover and cook for 2 minutes. Remove the cover and stir mixture. 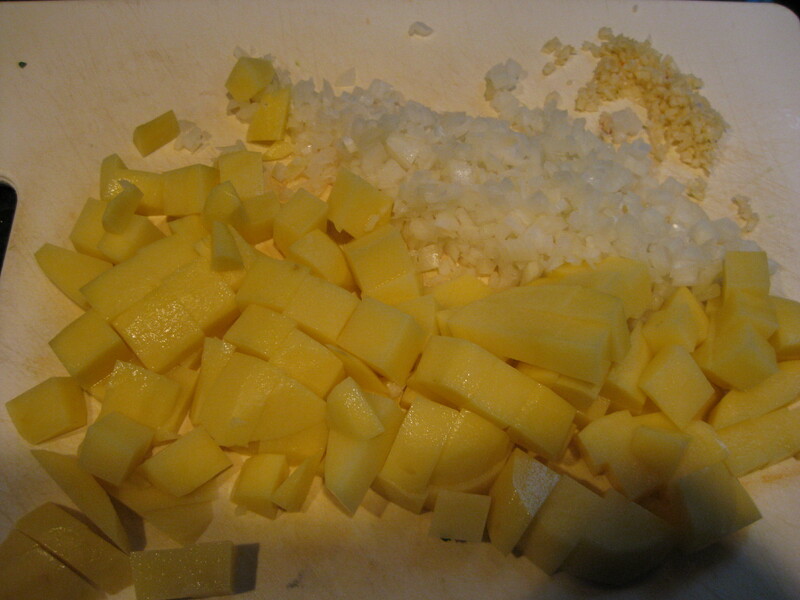 Continue cooking over medium heat, uncovered, stirring occasionally, until potatoes are barely tender. Use water as needed to scrape the fond (the flavorful tidbits of caramelized sugars and browned protein) on the bottom of the pan. This prevents burning and intensifies flavor. When the potatoes are almost tender add the kale and red pepper. Combine well, cover, and steam for 2 minutes. Stir again, cover, and steam for 2 minutes more, or until all the greens are wilted. 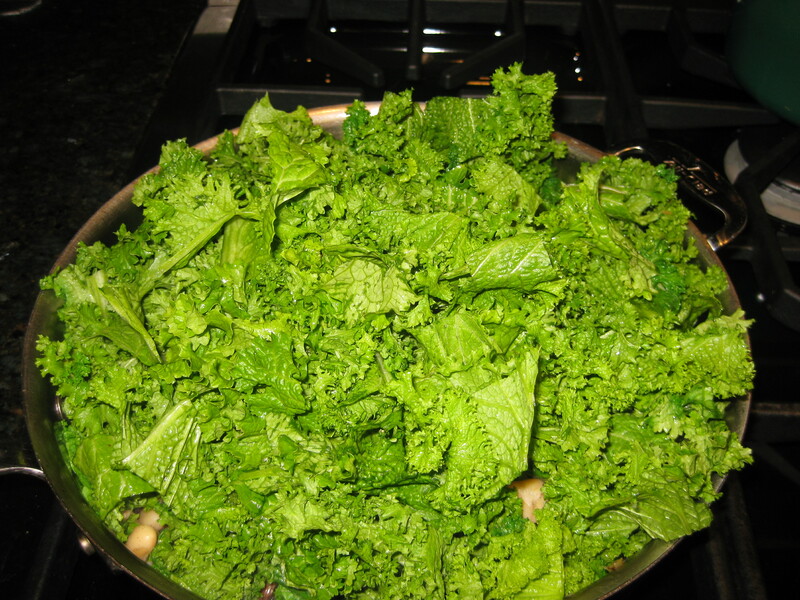 Remove cover and continue cooking, stirring occasionally, until the kale is tender, but retains its bright green color. Adjust seasoning with salt and pepper; sprinkle the top with lemon zest, and serve immediately. 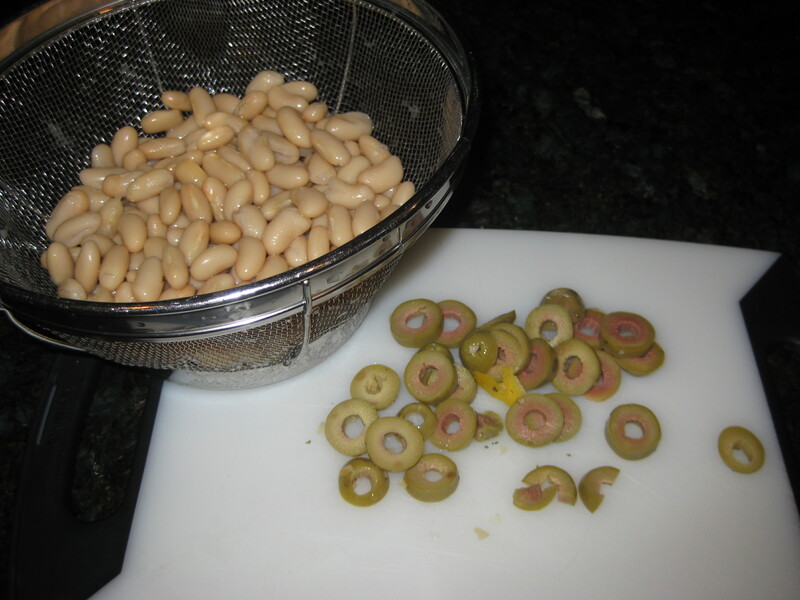 Drain and rinse the beans, slice up some pitted Mediterranean olives. Start the bacon in a cold pan, it prevents sticking. Add in the onion, garlic and beans. 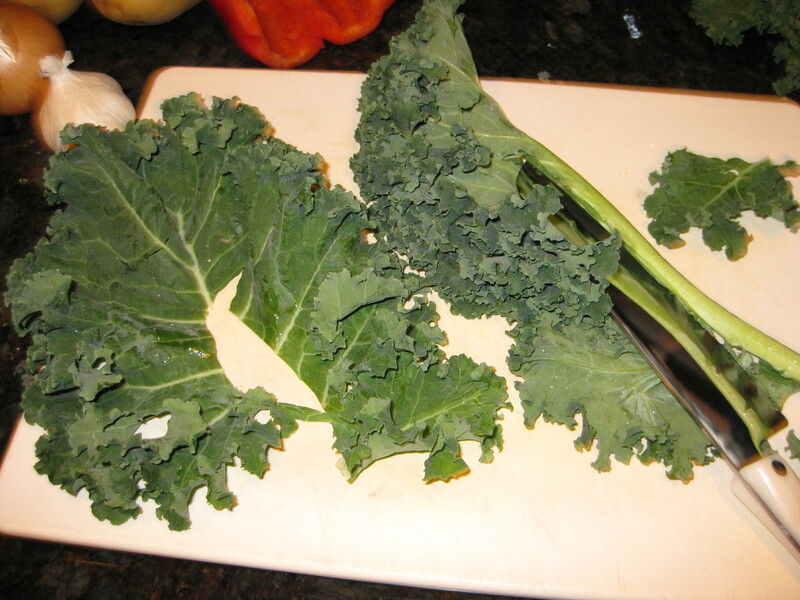 Mustard greens are firm and curly, which makes them a little bulky; add to pan in batches was the greens wilt. Keep pitted olives on hand for last minute garnishes. Place the diced bacon in a cold, large skillet over medium heat and cook, stirring occasionally, until fat is rendered and bacon is crisp. Lower the heat to medium and add the onion, garlic and pepper flakes to the bacon; cover and sweat for 3 minutes, stirring occasionally. 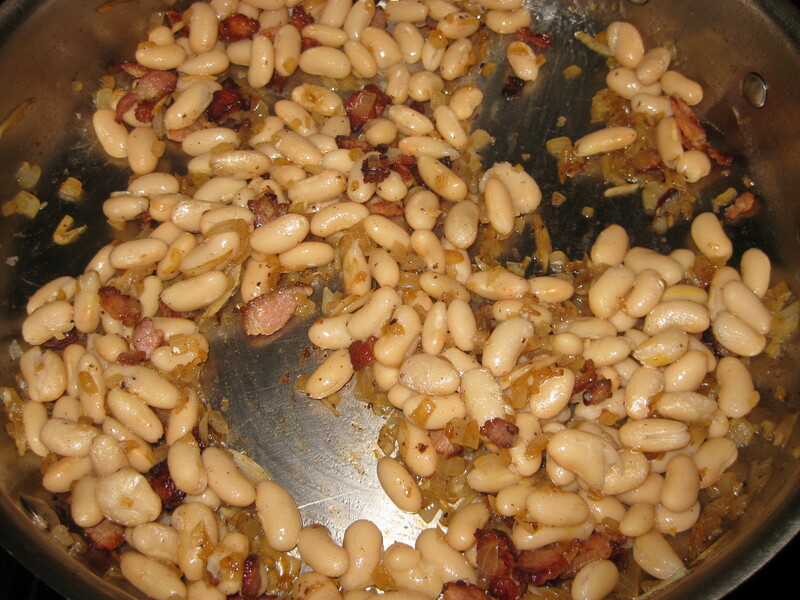 Stir in the beans and let them warm, about 3-4 minutes. Raise the heat again to medium-high, add the mustard greens and 1/4 cup cold water. Combine the ingredients well, cover, and steam for 3 minutes. Remove cover, add the salt and continue cooking, stirring occasionally, until the mustard greens are tender, but still bright green and the excess liquid evaporates. 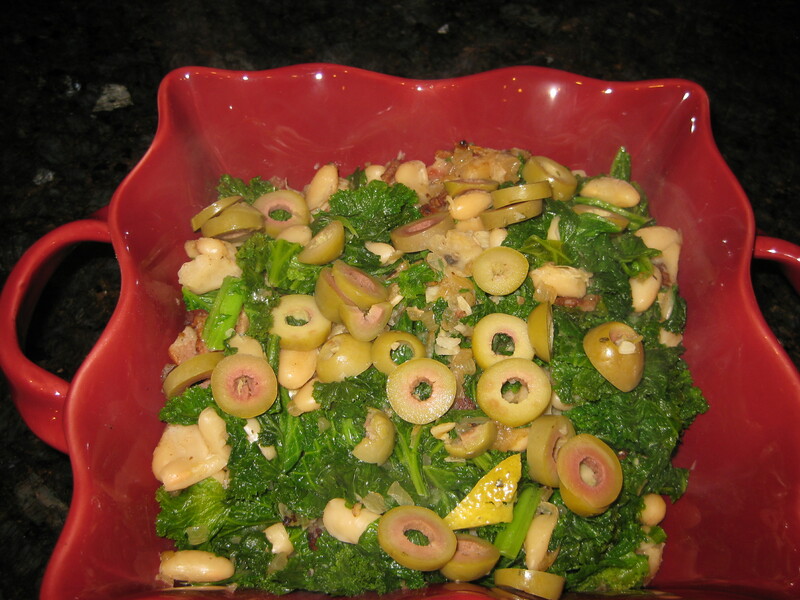 Garnish with sliced olives and serve immediately.